Planting your car just about anywhere almost always comes at a price; and, if you’re overdue for your return, odds are good that you’ll end up paying a much steeper price than intended. Parking meters are wonderful devices at telling the authorities just how much time you have left until you’re ticketworthy. [Zack] figured that five–even ten minutes late—is an absurd reason to pay a fine, so he’s developed a tool that will preload a meter with a few extra coins when the authorities get too close. The law-enforcement detection system puts together of number of tools and techniques that we’re intimately familiar with: 3D printing, Arduino, a photoresistor, and a proximity (PIR) sensor. At the code level, [Zack] filters his analog photo resistor with a rolling average to get a clean signal that triggers both by day and by night. The trigger? Two possibilities. The PIR sensor detects curious law enforcement officers while the filtered photoresistor detects the periodic twirling siren lights. Both events will energize a solenoid to drop a few extra coins through a slide and into the meter slot. For a collection of well-known components, [Zack] could’ve packed his contraption into a Altoids Tin and called it a day. Not so. As an interaction designer, looks could make or break the experience. For this reason, he opts for a face-hugging design with a steampunk twist. Furthermore, to achieve compatibility across a range of devices, [Zack’s] CAD model is the result of adjusting for various meter profiles from images he snapped in the urban wilderness. The result? A clean, authentic piece of equipment compatible with a family of meters. For the shrewd-eyed observers, [Zack’s] first video post arrived online in 2011, but his work later resurfaced at a presentation in the 2015 Tangible, Embedded, and Embodied Conference by his former design instructor [Eric Paulos], who was eager to show off [Zack’s] work. For a deeper dive into the upcoming second edition, head on over to [Zack’s] image feed. The Mayor of Silverton, Oregon is a hacker and wants to use roll-your-own hardware in the town’s parking meters. 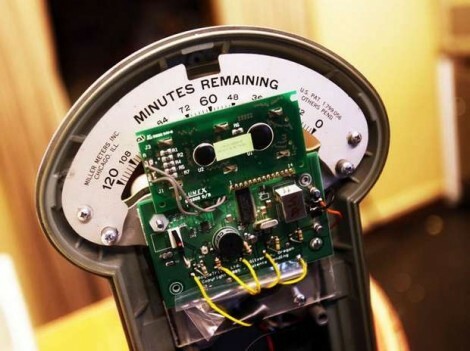 It’s not that he thinks he can do a better job than companies selling modern meters (although there have been notable problems with those), but he wants to retain the sentiment of the 1940’s era parking meters that are being replaced. Those meters are known as penny parking meters, because you can get 12 minutes of time for just one penny. Many municipalities have gone digital with parking payment systems due to costs associated with servicing mechanical meters and collecting coins from each one of them. This hack aims to keep the look of the vintage meters, but replace the mechanical readout with a digital screen. The meter would still offer a reasonable parking deal; five minutes for free. Cost for replacing the internals is estimated at $150 per meter… which seems just a bit high if they are looking at a 250 unit run. The main problem that we see with the idea is that the original parking meter bodies don’t have a slot which can accept quarters.